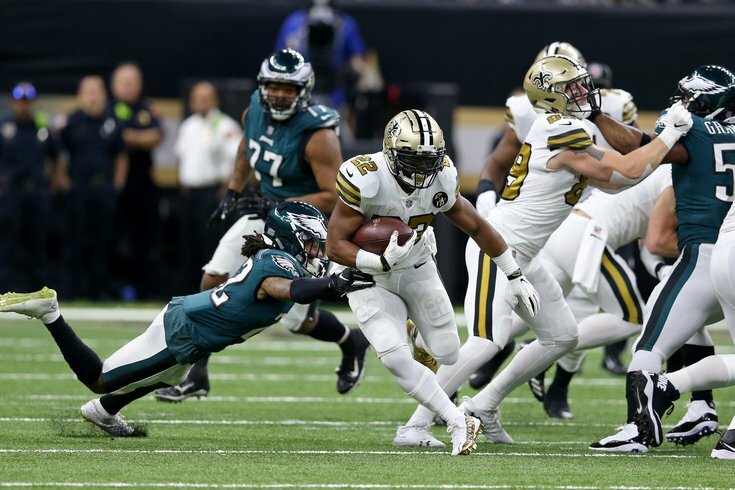 New Orleans Saints running back Mark Ingram runs past Philadelphia Eagles cornerback Sidney Jones in the first quarter. A week after suffering a devastating loss at home to the Dallas Cowboys, the Philadelphia Eagles will head on the road to play the New Orleans Saints, a team many think is the best in the NFL. As usual, the Eagles list a number of starters on their injury report, in addition to a laundry list of players already on IR/PUP/NFI. The Saints, meanwhile, are a very healthy team this late in the regular season. You can find the Eagles-Saints injury report with analysis here. Mailbag: Who has been the Eagles' biggest disappointment so far in 2018? As we noted in our five matchups to watch, the Eagles have a tall task trying to stop the Saints' passing attack, particularly with three starters in the secondary out. The Birds will have to find a way to generate pressure against Drew Brees, which also won't be easy, as the Saints have only allowed nine sacks on the season. The line on this game opened with the Saints being favored by 7.5 points, which has since jumped to 9.5. It is the first time the Eagles have been underdogs all season, and 9.5 points is the biggest underdog spread for abreigning Super Bowl winning team since 2009. Here are our staff writer picks, as well as who other publications are picking. Here are the rest of the games around the league. For the gambling degenerates, you can find our Week 11 NFL picks here.